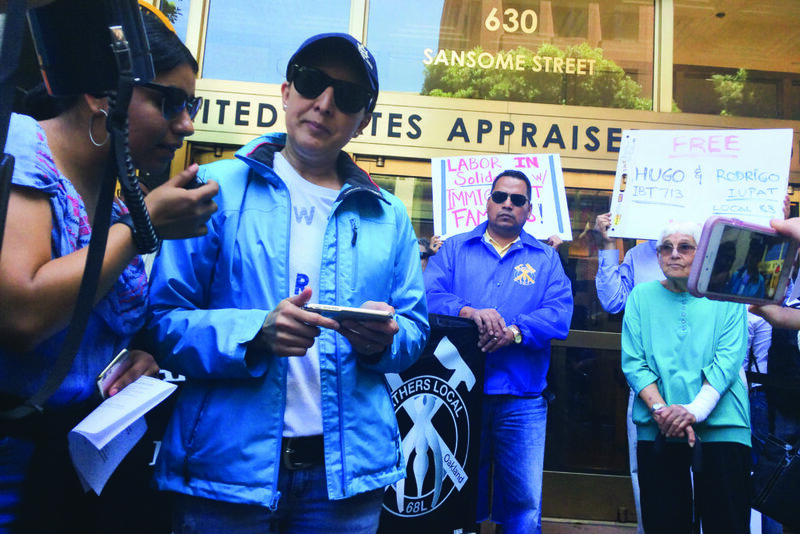 As the crowd swelled in front of the glass doors at the US Citizen and Immigration Services (USCIS) building in San Francisco’s Financial District, Sandy stood with her megaphone in defiance. As the Statewide Coordinator for the California Immigrant Youth Justice Alliance (CIYJA) she helped organize the rally. Roughly 100 people gathered at the USCIS building on June 5, many holding signs that read, “No human being is illegal” and “Free Hugo and Rodrigo.” The protesters were demanding an end to the targeted attacks on immigrant communities, and calling for the release of Hugo Mejia and Rodrigo Nuñez, two Bay Area men who were recently detained by immigration agents while at work. Sandy is undocumented, but her immigration status hasn’t deterred her from fighting on the frontlines for immigrant rights — and she is aware of the risks. 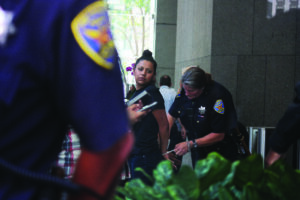 In 2015, she was arrested by San Francisco Police for occupying Sen. Dianne Feinstein’s San Francisco office in protest of a bill that would violate the city’s sanctuary city ordinance. Sandy, and other young activists say they are fighting, not just for themselves but also for their parents and older generations who have not been as willing or able to be so public with their activism. 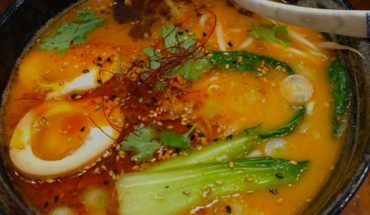 Putting themselves in situations that could lead to their arrest and deportation has won them many admirers, but also concern. “Of course it scares me that something may happen to my daughter,” said Sandy’s father, who declined to state his name. At the rally Sandy is interpreting for Yadira Munguia, whose husband of 18 years, Hugo Mejia, was arrested by Immigration and Customs Enforcement (ICE) on May 3rd at his job, around 50 miles northeast of San Francisco. Mejia and his friend Rodrigo Nuñez were employees of S&R Drywall construction company, working at a hospital located at Travis Air Force Base in Fairfield, California, which is not a sanctuary city. When military officials asked them for I.D. and Social Security numbers, the men handed over their Individual Taxpayer Identification Numbers (ITIN), something many undocumented immigrants use as their Social Security number. When officials learned the men were undocumented, they were arrested and detained by ICE agents. This kind of public activism is something Munguia had never considered before her husband was detained. 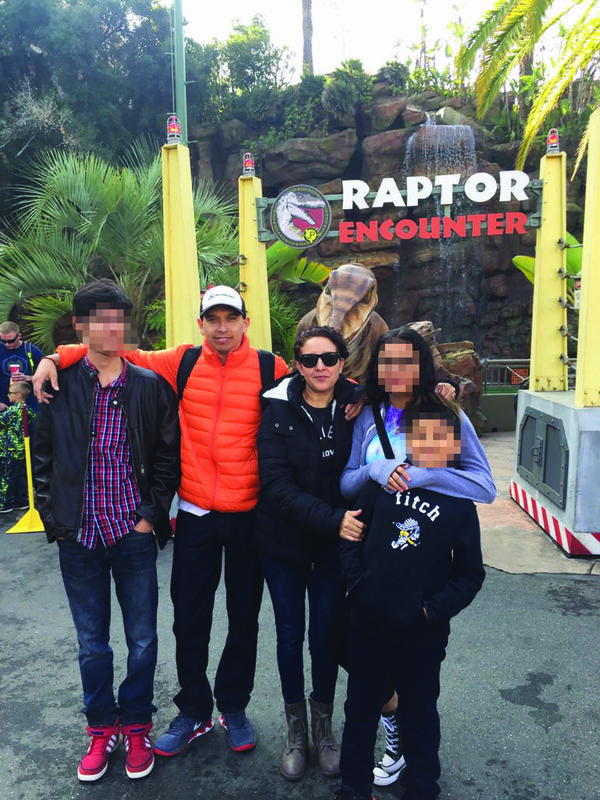 Although she’s been in the United States for 16 years, the married mother of three kept a low-profile, a lifestyle that many undocumented parents — even those who are residents of sanctuary cities like San Francisco — feel compelled to live. It was through meeting youth activists like Sandy, that Munguia first saw the stark contrast between her generation and today’s undocumented youth. Unlike their parents who brought them here as children, many of these young people are opting for a life of activism and public advocacy. Munguia admires the work that these young activists are doing, not only for her husband, but for immigrants in general. Sandy began organizing in 2011 as part of the DREAM Alliance of Sonoma County, fighting the record number of deportations being carried out during Obama’s presidency. Now, under the Trump administration, she is not only fighting against deportations and for immigrant rights, but for the preservation of sanctuary city policies. But the boldness of these young people who are undocumented has many parents worried. In 1997 Sandy’s father immigrated to Vallejo, a Bay Area city roughly 30 miles north of San Francisco. After his first year living in the U.S. he recognized the opportunity for a better life and moved his family, including Sandy with him. But this sort of activism comes at a cost. In May, Claudia Rueda, a 22-year-old immigrant rights activist from Los Angeles, was detained by border patrol as she was moving her family’s car outside their Boyle Heights home. Sandy believes Rueda was detained in retaliation for fighting her mother’s deportation case. San Francisco can trace its history as a sanctuary city to 1985, when the Board of Supervisors passed the “City of Refuge” Resolution, which declared the city a sanctuary for the estimated 60,000 to 100,000 Salvadoran and Guatemalan refugees in the Bay Area fleeing political violence and persecution. 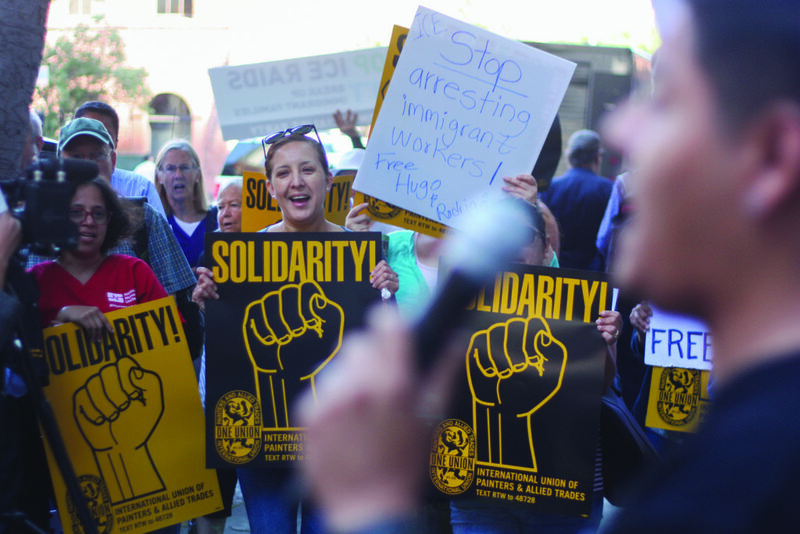 That resolution was expanded to a Sanctuary Ordinance in 1989 and reaffirmed in 2007 by then-Mayor Gavin Newsom, which prohibits city employees from aiding ICE agents in arresting or investigating undocumented immigrants. Though Sandy’s father doesn’t live in San Francisco, he like Hugo Mejia and Rodrigo Nuñez works in construction, and being in a sanctuary city makes him feel safer. One of the Trump administration’s first actions was to threaten sanctuary cities like San Francisco with cuts to federal funding, alleging that these cities are harbors for criminals. This threat is part of a broader agenda by President Trump to restrict immigration and deport 2 to 3 million undocumented immigrants in the immediate future. The anxiety being felt by immigrants in the current political climate is taking its toll, even on those who were inspired by the DREAMer movement during the Obama administration to be more outspoken about immigrant rights and being undocumented. Augustine, a 24-year-old man originally from Mexico who requested that his real name not be used, is one such immigrant. Augustine’s family immigrated to San Francisco when he was three in search of a better living opportunity, but they soon discovered new hardships and fears awaited them in the United States. At one point Augustine felt emboldened enough to serve on the City’s Youth Commission and tell his story to large crowds at public events. Since Mr. Trump took office, Augustine has become more guarded because he feels that speaking out could be dangerous. He relies on the Obama-initiated program, Deferred Action for Childhood Arrivals (DACA) and with the recent push by Republican officials for Trump to end DACA, Augustine feels reluctant to be as public as he once was. But he remains committed to working within the immigrant rights movement and supporting undocumented people. He currently attends City College of San Francisco and hopes to one day become an immigration attorney. Augustine and Sandy feel that they, and countless others brought here as children, are just as deserving of basic human rights as any other American, and they’re prepared to fight for them. And for that, Sandy’s father is grateful. “I had a lot of hope that me and my family would be able to legally stay in this country,” said Sandy’s father, who, like many parents felt the sting when another Obama-era program, Deferred Action for Parents of Americans and Lawful Permanent Residents, also known as DAPA, was recently revoked by the Trump administration. The program, in a similar way to DACA, intended to offer a three-year renewable work permit and exemption from deportation for undocumented parents whose children are either permanent residents or citizens of the U.S.
“My parents are very fearful of the work that I do. But also, they know that it’s needed. Someone has to do the work to make sure that things like this don’t happen,” Sandy said. This article was written by Alexis Terrazas and Destiny Arroyo as part of a collaboration between Feet in 2 Worlds and El Tecolote, San Francisco’s Latino bilingual newspaper serving the Bay Area since 1970. Special thanks to New America Media. Alexis Terrazas began as editor-in-chief of El Tecolote in June of 2014. A San Francisco native with extensive experience, both as a reporter and as an editor, he was awarded a Peninsula Press Club Herb Caen scholarship in 2006, before going on to study journalism at San Francisco State University. While at State he earned many journalism awards and did some writing for El Tecolote. He graduated in 2010 and began work for the San Francisco Examiner as a sports writer.